Turkish, Russian and Iranian leaders in Ankara on Wednesday stated that they were committed to achieving a "lasting ceasefire" in Syria. 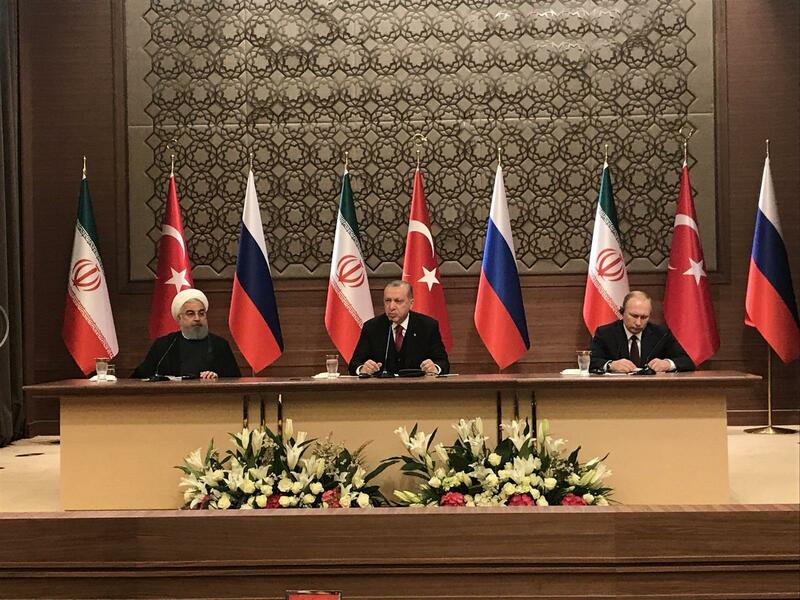 A joint statement is issued by the leaders following the summit between Turkish President Recep Tayyip Erdoğan, Iranian President Hassan Rouhani and Russian President Vladimir Putin. At the press conference, Turkish President Erdoğan said that "as Turkey, we are fulfilling our responsibilities with regards to de-escalation zones in Syria. By erecting an eighth observation post in Idlib, I think we have shown our decisiveness. We want the whole world to take a note that territorial integrity of Syria depends on taking equal distance from all terror organizations." Erdoğan noted that Turkey will work together with Russia and Iran to improve the living conditions of Syrians who have returned to the Tal Refaat. Erdoğan stated that Turkey would not stop till ensuring security in all regions under the control of the Democratic Union Party (PYD) and its armed forced People's Protection Units (YPG), which Turkey regards as the Syrian wing of the Kurdistan Workers’ Party, which has been fighting inside Turkey for more than 30 years. Erdoğan also responded to the U.S. claims that the fight against Syrian-Kurdish militia weakens the fight against Islamic State (Daesh). “Our fight against PYD/YPG does not prevent or hinder the fight against Daesh, instead it complements it. Any approach that denies the fact that Daesh and PYD work for the same objectives cannot contribute to a sustainable peace to be established in Syria,” told Erdoğan. Iranian President Rouhani began his speech by thanking President Erdoğan for his sincere hospitality then slammed the United States for wanting "terrorist organizations like Daesh to last a long time in our region as their tools so that they can use them." Rouhani stated that the peoples of Syria and Iraq had foiled this "big conspiracy" by the U.S.
Russian President Putin stated that the heads of the three countries discussed how to establish normalisation in Syria and that they are determined to protect Syria’s territorial integrity and independence. “Our aim is to wipe out the terrorists totally. They are trying to prevent our efforts for peace. They attempt to stage provocations during which militants use hazardous chemicals, We have clear proofs of this,” said Putin. During the question and answer season, Iranian President Ruhani, when asked about what the Iranian and Turkish government would do about the sabotage they might face in Syria, said, "so far we have seen that that Americans and Israelis have been unsuccessful. They want terrorists to be in control. They were going after their own interests. Despite the fact they they [Americans and Israelis] created some problems for the Syrian people, we still cannot say they were successful." Turkish President also responded to the same question and said Turkey cannot accept the division of the territory of Syria that some people might have planned. Erdoğan and Rouhani also evaluated the U.S.’s plans to withdraw from Syria. “Americans say a different thing everyday. We can trust neither the statements nor the promises of the recent American government,” Rouhani said. “They said they wanted to withdraw, but later it was understood that they were after money. They say to Arab countries ‘if you give us money, we will stay in Syria’”. “My friend Rouhani does not say the amount of money. It is 7 trillion dollars. They say that this is the amount equal to their costs up to now, they say that this amount should be given to them,” added Erdoğan.